​We offer a free roof inspection, at your convenience. The inspection will evaluate the health of your roof’s system. We will provide you with a detailed written report explaining the health of your roof, potential problems, estimate of additional life expectancy, and finally budget friendly solutions to any problems found. The least costly type of rubber membrane for a roof. The top is a white reflective color that will help reflect the sun’s light reducing heat buildup in the building. The membrane resists corrosion upon contact with many materials unlike some rubber membranes. Choice of installations methods: Attached with fasteners or glued directly to the roof. The seams between TPO strips are heat welded with a hot air welder. ​Fire Resistance- This is a good choice for small businesses that do a lot of welding, restaurants or bakeries... any business with fire hazards because of the fire retardants build into the membrane- extra protection against a fire spreading by the Roof. 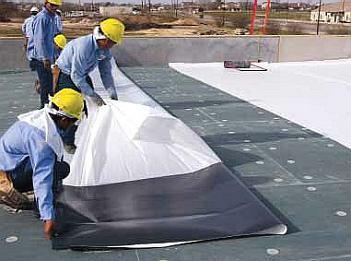 ​​Lifespan averages out to 20 to 25 years depending on climate, quality of material and quality of installation. Quality varies greatly from one manufacturer to another and sometimes price isn’t an indicator of good quality. Since the rolls come 6 to 12 feet wide, you will have a seam every 6 to 12 feet which does increase the possibility of more opportunities for penetrations due to errors in installation or simply an aging roof. Checking the TPO Roof regularly and after storms for debris, worn areas along the seams, and ponding of water is necessary to reach the full estimated lifespan of the membrane. ​Insulation Proprieties- We recommend installing Rigid Foam Insulation 1 inch thick equivalent to 6 R insulating value. TPO single-ply (not very thick) membrane is good during the cooling season because it reflects the sun light away reducing the transferred heat gain in the building below, However, during the winter months when heat in a building escapes through the roof, the foam insulation will help retain the building's heat. TPO Roofs need regular inspections to check for worn or damaged areas. The waterproof TPO membrane can be injured by debris being blown on the roof during severe storms or being dropped from overhead trees. Critters, such as squirrels and mice will crawl through vents and gaps in areas where pipe and cables go into the building. These openings also allow moisture infiltration, and will cause roof decay and promote a mold infestation. Regular inspections will enable minor repairs at the beginning of a fault- encouraging a long functional lifespan for the TPO roof. Debris should also be look at to determine where it’s coming from. On a flat roof whatever drops on, crawls on and blows on will stay till somebody takes it off. If there are any trees hanging over the roof, they should be cut back to remove critter highways and to prevent the dropping of foliage or branches. ​Fixing problems on a TPO flat roof can be troublesome because there is a common misconception that the existing membrane surface does not have to be scrupulously cleaned to accept the repair patch. Many novice repairs fail to bond because the prep work hasn’t been done (trying to save time). Best way to check bonding of a TPO patch is to check the sealed edge of the patch by trying to slip something thin under it. When proper bonding between the original TPO and the patch doesn’t occur, water will seep under the patch and onto the roof mostly unseen till the damage shows up on the ceiling in the building below. To seal the bond between TPO patch and the roof membrane specialized equipment is needed, such as a TPO material patch and a hot air welder- property owners just don’t have those items on hand. Plus, if they tried to get a small patch of TPO material from a roofing manufacturer they’ll probably be required to buy a lot more than a small piece. Use the wrong material on the TPO roof and it could increase the area of damage that needs to be fixed making an inexpensive repair more expensive. Probably the best thing to do would be to tape some plastic sheeting over the damage and call a roofing company like Central Virginia Roofing. We will come out as quick as your schedule allows and preform a free inspection. As a TPO roof ages, the membrane will shrink, crack, craze and deteriorate over years. If the roofing membrane has numerous cracks and appears to have pulled away from the seams, then it’s time for a new roof. Although your allowed to have two layers of roofing, it is best to know if there is moisture damage underneath. The insulation may need to be changed out, and wood framing may need to be repaired. One way to find hidden moisture is by infrared digital imagery conducted with a scanner or camera. Areas with wet insulation will be lower in temperature then dry areas and can be seen clearly in the scan. However, an experienced operator needs to take the test and interpret the results because the readings can be affected by surface moisture (surface needs to be dry), daytime vs. nighttime temperature (scans are normally taken at night), differences in insulation thickness, and heat sources within the building. An experienced operator can recommend verification procedures, such as test cuts and moisture probes to be absolutely sure. These preparations will cause increased costs, however they are very necessary to obtain a superior long lasting roof. Click! for information on other types of Flat Roofs.